PETA's latest stunt? After reading about how difficult it was for U.S. soldiers to get chocolate in Afghanistan, they've teamed up with Harbor Candy to make "Bin Laden Bites." 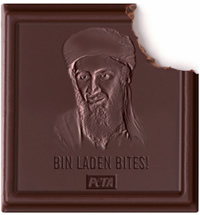 They write on their blog: "When the troops sink their teeth into our savory, vegan chocolate Bin Laden Bites, they'll satisfy their confectionary craving while getting some sweet revenge by taking a bite out of Osama's head." PETA claims that proceeds from sales will be used for their programs that help dogs, including their spay-and-neuter clinic. Because nothing tastes better than smug veganism, except maybe smug veganism dressed with a soupcon of jingoistic enemy-baiting. $15.00 for five pieces. Chocolates with the image of a mass murderer on them? 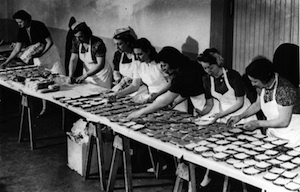 What's next - Charles Manson bedtime mints? PETA is out of their minds. No one can accuse PETA of good taste. You don't want to put something repulsive in your mouth. Blech. Bin Laden toilet paper, now there is something worth marketing. Just proves that PETA is all about bad taste. Ahh yes - PETA - reaching another low, all the while managing to give a whole new meaning to "bad taste" for sure. This move also seems like a complete disrespect to our service members. Insinuating I think that they would be interested in this crap chocolate with Bin Laden's head on it they because they are the armed, camo'ed equivalent of Beavis and Butthead or something. Ridiculous. How about a little respect for our men and women serving? If PETA had any class they would simply stamp "Thank you for your service" and be done. I think this is a wonderful act of gratitude on behalf of PETA. It shows that animal rights activists love their country, think about the troops and do their part to say "Thank you" to the men and women who devote their lives to our freedom. I support the troops, and so does PEAT - good on them! Anyone who thinks this is "bad taste" is simply espousing negativity towards the animal rights movement. It is sad that some people cannot look past the political beliefs of another person or group - even on a fundamentally American issue such as showing gratitude to our troops. I think PETA did this very tastefully. They gave the troops some chocolate without the routine animal cruelty and animal abuse that goes along with the production of dairy. Milk is so yesterday - vegan chocolate tastes better anyway - not to mention it isn't loaded with saturated fat and cholesterol.